I received some very interesting Google alerts this week, so let’s take a brief break from author interviews and see what’s happening in e-format world. First, we have news from the Financial Times’ Digital Media Conference which was held in London last week. Of course, one of the panel discussions focused on “The eBook (r)evolution”. “The people buying these devices (eReaders) are reading more frequently than those with tablets. They read for longer sessions and are more committed”, said Serbinis. “We definitely see tablets as for casual readers.” You can read the whole article here. 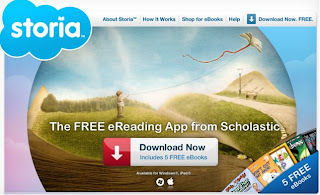 Specific to the children’s genre, Scholastic has announced it is digitalizing much of its list and is releasing an e-reading app called “Storia”. The app will include a large e-bookstore and it helps kids read e-books based on their reading level. Expected release date is sometime in the fall of this year. Read the full story here. Over in the UK, The Daily Mail reports print book sales are seriously slumping as the e-format becomes more and more popular. In the first eight weeks of 2012, Britons bought 7.6million printed novels - almost two-and-a-half million fewer than books bought in the same period in 2011. The slump (which does not include non-fiction and children's books) coincides with a jump in sales of e-readers. When sales of children's books and non-fiction are included, the number of books sold in the UK fell by 4.7million to 25million during the eight-week period. Of course, this has sparked fears over the future of Britain's book shops. The article states that book sellers have taken £28million less than they did a year ago. Here's the link to read the full report. Check this week's Kids' E-Book Bestseller List for the last top ten books in the the most popular e-stores.